Say “no more” to the snore! How a dental oral appliance can help with snoring! Sleep. We all seemingly can’t get enough of it these days. One of the causes of this is… you guessed it… snoring. Say “no more” to the snore! How a dental oral appliance can help with snoring. Sleep. We all seemingly can’t get enough of it these days. One of the causes of this is… you guessed it… snoring. It has been estimated that 60 million Americans snore and at least 18 million suffer from obstructive sleep apnea (OSA). The most common signs of OSA are snoring and excessive daytime sleepiness. Because patients visit their dentists on a more regular basis than most other health care professionals, dentists have an excellent opportunity to educate, diagnose and potentially treat patients with the use of oral appliances. Snoring is defined as obstructed breathing during sleep and is caused by vibration of the pharyngeal tissue; when this tissue collapses, it partially blocks the airway. 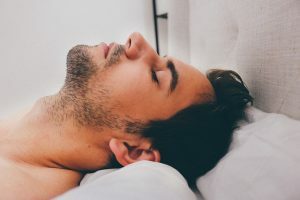 Snoring usually occurs upon inhaling but can also occur while exhaling when there is a partial blockage of the airway, often caused by the tongue becoming too relaxed. If this is the cause of snoring, it may be corrected with an oral appliance, which works by moving the lower jaw and tongue forward to keep the airway open during sleep. Oral appliances can be extremely effective in eliminating snoring and OSA, particularly in patients with mild to moderate OSA. They function by moving the lower jaw and, consequently, the tongue, forward to open the airway. They hold the lower jaw forward when the patient sleeps on his or her back, which keeps the airway open all night. Learn more about oral appliances and if you – or your sleeping partner – may be a candidate for one by making an appointment with your Longmeadow Family Dental professional or call 301-739-1100. And say “no more” to the snore!